Why do my kids get the cold so often? This is because the immune system of children is not fully developed yet. There are 200 cold viruses that can infect a child especially when they start going to school where they come in contact with other children. 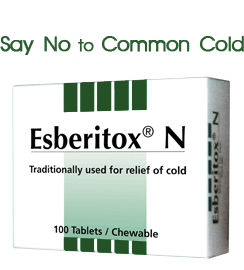 How does Esberitox®N help to overcome cold and how is it different from cold medication? Esberitox®N a German herbal formulation which can boost the immune system quickly and effectively hence it is able to overcome cold infection quickly. It is most effective when taken during the onset of cold. Cold medication only helps to mask the symptoms of cold but can not help to overcome cold infection itself. How long should I give Esberitox®N to my child ? You should give until the symptoms (runny nose, sneezing or blocked nose) stop. For children with frequent cold, it is good to continue for another 3 days to ensure that the symptoms do not start again. Is it safe to give Esberitox®N to my child? I noticed my child tends to get the cold symptoms when it rains or when they go back to school. Can I use Esberitox®N to protect them from the cold? Yes, Esberitox®N can help your child from getting the cold. You need to give them during times when you know they are likely to get the cold as you mentioned. I have three children between ages of 3 to 8 years. I noticed that when one gets the cold, it will spread to the other two. It is stressful to have all the three children sick at the same time. Can I use Esberitox®N to prevent the cold from spreading from one child to another? Esberitox®N has been successful in preventing the spread of the cold between child by strengthening the immune system of the other children so that they are able to fight off the virus. For such protection, give the child Esberitox®N for 5 days. My child have cold very frequently, can I give Esberitox®N to my child everyday? For children with recurrent cold, Esberitox®N can be taken for one month to reduce recurrence. Subsequently, we advise to take Esberitox®N only when the child gets an initial sign of cold or as a prevention when there is a high chance of catching a cold as Esberitox®N can strengthen the immune system FAST.